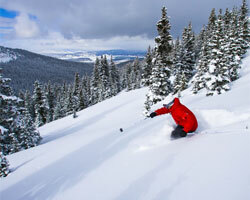 Excellent skiing and riding conditions being reported in Winter Park, Colorado. Book now and we will offer 4th night free and Kids ski free. Buy three consecutive nights, get the 4th night FREE! -One child (age 6-12) FREE lift ticket per paid adult lift ticket, 4- day minimum required Valid through April 24, 2010 New reservations only. Call a Winter Park Ski or Ride Specialist today at 888-754-2167 and let us help you plan that perfect Winter Park holiday.